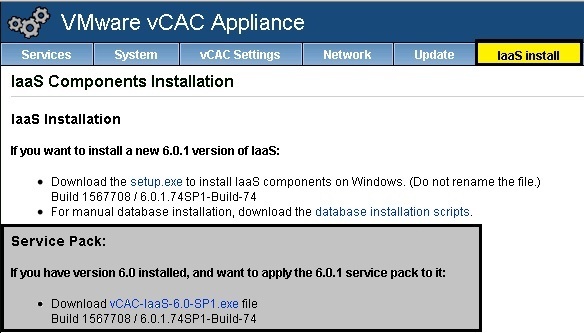 In this blog post we will see HOW TO : Upgrade vCloud Automation Center (vCAC) 6.0 to 6.0.1. 1. It is assumed that the vCAC Appliance is using vCenter 5.5.0b’s SSO. This leaves out the necessity to deploy/upgrade Identity Appliance. Steps involved in updating the Appliance. Go to the management console for your virtual appliance by using its fully qualified domain name, https://vcac.example.com:5480. Log in with user name root and the password you specified when the appliance was deployed. This will take a while and then you will see the next available update(For this to work, the vCAC Appliance should be talking to the internet). Once the Available update is checked and ready to update, Click on ‘Install Updates’ under Actions Tab. This will pop up a window asking for confirmation to proceed with the upgrade. Click OK.
Now the upgrade process will start. An informational message stating that the update is in progress appears. The time it takes for the update to finish is dependent on your site environment. After the Upgrade process is complete, reboot the virtual appliance. Click the System tab. Click Reboot and confirm your selection. Now login back to confirm the update has completed. Verify that services are running. Log in to the vCloud Automation Center Appliance management console. Now Navigate to IaaS Install Tab. Download the setup onto the IaaS server and upgrade all the components.